Torrey House Press, 9781937226251, 365pp. Leonard Self has spent a year unwinding his ranch, paying down debts, and fending off the darkening. Just one thing left: taking his wife's ashes to her favorite overlook, where he plans to step off the cliff with her into a stark and beautiful landscape. But Leonard finds he has company on a route that intertwines old wounds and new insights that make him question whether his life is over after all. "Part modern western, part mystery, this first novel will appeal to fans of Louise Erdrich and Kent Haruf. Quimby's prose reads so true, it breaks the heart." "The Colorado setting and the author's simple style of prose perfectly complement the complexity of the human spirit in this superb debut." "Quimby's storytelling, his humane impulses and his lyrical passages on the meaning of love and time, and on the history, geology and botany of the region, will surely impress readers." "Quimby uses words as spare as Colorado's landscape to describe characters who range from endearing to crusty, wise to foolish, spiritual to downright evil. The folks who live near Monument Road aren't just descriptions in a book; they're complex people readers will care about." "Not to be overlooked is the love, humor and friendship among pain and loss, which makes it a book far more about the richness of life than the finality of death." "Monument Road is a wonderful novel full of wit and wisdom, generosity and malice." "Quimby's writing is sensitive and graceful; he has a talent for revealing slowly blossoming characters who are beautifully flawed and realistic." "While not exactly a happy novel, Monument Road is beautiful and real, full of landscape imagery of the American Southwest as a poignant and sometimes haunting metaphor of our connections to the land." "This is a novel with size and scope and generosity, with an acute understanding of human nature and a deep appreciation for the ways people face change and work out their lives in relation to each other." "In prose that might have been chiseled from the magnificent landscape he describes, Charlie Quimby has written a great big American Novel. Full of pathos and humor and sadness, you won't reach the end of this book without feeling fuller and wiser. What a gift Charlie has given us." "Monument Road is a legitimate modern western, complete with an impressively authentic and aging rancher, heartache, ghosts, low-lifes, a rural landscape undergoing radical transformation, a glut of evangelical churches, and the ancient, powerful cliffs and mesas that surround it all, in southwestern Colorado. The narrative is likewise unpredictable and wild A pleasure to read." "The landscape and characters of Monument Road ring true. Charlie Quimby has created a story that is hard to forget. His attention to the details of a fading life and life style are spot on and will be a window to any reader's understanding of the central phenomenon of the New West." 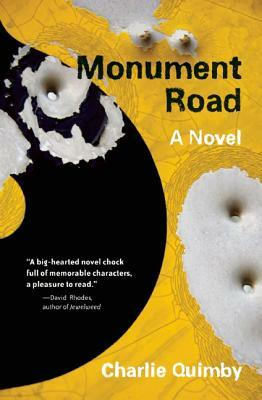 "Monument Road is a big-hearted novel chock full of memorable characters, a pleasure to read." Charlie Quimby's writing life has always crossed divides. A playwright turned critic. A protest songwriter who worked for a defense contractor. A blogger about taxpaying and homelessness. He wrote award-winning words for others in Harvard Business Review, Financial World magazine and the NFL Hall of Fame. Naturally, he splits time between Minneapolis and his native western Colorado.